Mr Laurence told SWNS the car was on the wrong side of the road, with the driver’s side door jammed against the ground. Mr Hudson explained he lost control of the car on the single-lane road when it skidded on “standing water”. 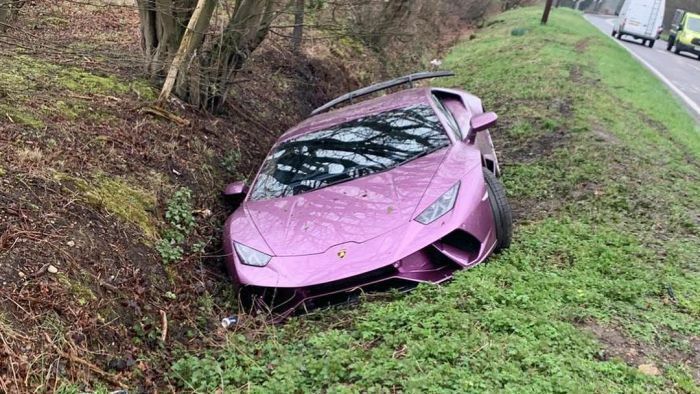 “I was heading towards that pole over there,” Mr Hudson said at the scene of the crash in a video posted to YouTube by celebrity car customiser Yianni Charalambous. “This guy is the calmest guy in the world,” Mr Charalambous said. Mr Hudson posted images of the car on Instagram, acknowledging he had “a bad day” but said the vehicle had only received minor damage. “Damage isn’t too bad and I’m sure she will be back on the road soon enough,” he said.